Unidentified Aerial Phenomena sightings were reported over: Alaska, California, Florida, Indiana, Nevada, New Jersey, New York, Pennsylvania, South Carolina, Tennessee, and Texas. Sightings of UFOs were also reported in: Australia, Brazil, Canada, Germany, Mexico, Peru, Spain, Slovenia, South Africa, Sweden, Taiwan, England in the United Kingdom, and U. S. Virgin Islands. Scott Waring writes, “I admit I knew this would happen and yet when it does happen…it still pisses me all to hell. Last year I reported about the UFO on Google Earth map that was over the Cape of Good Hope light house and I said that you need to check it out before Google deletes it…well its gone. The photo bubbles that allow you to see a 360 view of the area has vanished so this post is in memory of the sighting and to show the world that Google is part of the cover-up of UFO information. Like you didn’t know that all ready right? Editor’s Note: I attempt to show the photos being sent by witnesses. Some like this photo from Fresno, California for example likely has light reflections on the lens, but one or more lights may be a real flying object. February 20, 2014 — (TRN) The Tokyo Electric Power Company (TEPCO) which operates the Fukushima Daiichi nuclear power plant, crippled by an earthquake and tsunami in March, 2011, announced it spilled 23 TRILLION units of radiation Wednesday, as one of their storage tanks “leaked. Tokyo Electric Power Co. said, “It found a new leak near the tanks holding contaminated water at the disaster site. About 100 metric tons (26,400 gallons) of water may have escaped a concrete barrier,”the company said. Beta radiation readings of 230 million becquerels per liter were taken in a water sample collected today near the H6 tank area at the Fukushima Dai-Ichi plant, according to an e-mailed statement from the Tokyo-based utility. (230 Million times 100 tons = 23 Trillion units) In addition to this enormous spill, about 300 tons of contaminated groundwater seep into the ocean each day at the Fukushima 240 kilometers (150 miles) north of Tokyo, Japan’s government had said in the past. It has now been 1,076 days since three reactors at the Fukushima plant melted-down and exploded, releasing more radiation into the atmosphere in that one week, than all the nuclear test-detonations by all the countries of the world, combined. Over and above the atmospheric radiation, there’s also been 300 tons of water per day, (79,200 gallons) times 1,076 days equals 85,219,200 gallons of lethally poisoned radioactive water that has poured into the Pacific Ocean. In fact, Reactor Building #3 is still so heavy radioactive, they have not been able to send anyone – or even any robot- into that building. If any person enters that building, they will receive a lethal dose of radiation within 6 minutes and die within hours. Any robots they tried to send in, failed; their circuitry disintegrated — not from heat — from radiation. Between May 2011 and August 2013, as many as 20 trillion becquerels of cesium-137, 10 trillion becquerels of strontium-90 and 40 trillion becquerels of tritium entered the ocean via groundwater, according to past statements from TEPCO. Drinking water at 300 becquerels per liter would be approximately equivalent to one year’s exposure to natural background radiation, or 10 to 15 chest X-rays, according to the World Health Organization. Is there any wonder at all why sea life in the Pacific Ocean is dying planet-wide? Starfish off the coast of California are literally melting on the sea floor. U.S. Fisherman can’t find any Sardines. Whales and even sharks are showing up with huge tumors. Tuna, caught off California tested 100% positive for radiation. The Nuclear Regulation Authority (NRA) accused TEPCO of lacking basic understanding of measuring and handling radiation. All these things are taking place and yet the US government is not testing Pacific ocean water for radiation levels! The leakage of radiation-contaminated water is posing a major threat to Japan’s population and environment and to the international community since the March 2011 disaster. OOOOPS: Last Night 23,000,000,000,000 units of spilled at Fukushima Nuclear Disaster Site 899998. Air Force “Neighborhood Watch” Satellites for Detecting UFOs? “The Air Force will launch two previously classified space-surveillance satellites into orbit later this year that represent a “significant improvement” in monitoring activities in near-geosynchronous orbit where the United States has some of its most valuable space assets,” said General William Shelton, head of Air Force Space Command. Shelton lifted the veil on the Geosynchronous Space Situational Awareness Program, or GSSAP, satellites during his February 21 speech at AFA’s Air Warfare Symposium in Orlando, Florida. The satellites will carry electro-optical sensors and will function in a “neighborhood watch” role, detecting threats to US space assets like debris or a spacecraft that a potential adversary is trying to hide on orbit that could harm US satellites, said Shelton. The two spacecraft will “drift just above and just below the GEO belt,” he said. They will complement the Space Based Space Surveillance satellite that’s been on orbit since 2010 and US ground-based space-monitoring sensors, said Shelton. Orbital Sciences is the prime contractor. A United Launch Alliance Delta IV booster will carry the satellites into orbit from Cape Canaveral AFS, Fla. Two GSSAP replacement satellites will follow in the 2016 timeframe, said Shelton. Rather than catching adversaries who might interfere with our satellite system, the White House prefers to simply let everyone know that they have the ability to monitor the satellites closely. J. P. Skipper writes, “The image demonstrates a small round flat disk on the ground apparently caught in a rock crevasse that is also filled with soil. If it is soil and not dithering smudge image tampering, the soil covers roughly half the disk hiding that portion from view. Note that the surface of the disk reflects sunlight a little more than the adjacent rock surfaces and more uniformly. This suggests that this object may very well be smoothed metal. Also note the uniform thickness of the disk as demonstrated by its left exposed portion casting a short shadow against the rock surface it is laying on. Now this disk obviously looks like a metal coin and is very suggestive of that as many of us will see it. However, without the fine detail of the disk’s surface, we can’t be conclusive beyond this being just very suggestive. This inconclusive situation to a large extent is a function of the very high .jpeg compression on this imaging as released for public consumption. This object is plenty close enough to the Spirit rover panoramic camera that such details should be available to us if this imaging is as good as it was suppose to be. In the past, the NASA/JPL hype prepared the public for the near future rover imaging to come. There was much bragging about the super high digital pixel count that could be expected of the rover imaging. I have no doubt that this bragging entirely represented the truth but look what is released to us with all that mega definition stripped away by severe .jpeg compression processing and now posing as the real raw science data, but isn’t. At this close range to the rover panoramic camera, we should be able to zoom in on this object and determine its surface details, which of course would at the very least give us a fine idea as to whether this is a actually a coin or not. If this was some of our own personal fairly crude photography here on Earth using just 3-5 megapixel cameras and using just a high quality .jpeg compressed format, we would be able to do so. But here, with state of the art scientific cameras and with super high resolution many many times what our personal digital cameras can produce and paid for my taxpayers, we’re lucky to be able to determine that this is a disk at all. Further, I suspect that even this crude visual awareness of ours is not welcome in certain quarters. It’s easy to get mad about this. It is also especially frustrating for someone like me trying to determine the value of evidence and bring it to your attention. On the other hand, I am reminded of an entire world full of skilled academics, scientists, engineers, graphics specialists, and those interested in photography being so blind to the obvious. How can so many of these millions of people looking at their own photography and even some looking in Earth satellite imaging, not see this super obvious right in one’s face visual disparity? It is clearly impossible and yet no one questions it or feels compelled to question it. People treat us like this because we allow them to do so. X-FLARE! Long-lived sunspot AR1967 returned to the Earth side of the sun on February 25th and promptly erupted, producing an X4.9-class solar flare. This is the strongest flare of the year so far and one of the strongest of the current solar cycle. A movie from NASA’s Solar Dynamics Observatory shows the explosion hurling a loop of hot plasma away from the blast site. Coronagraphs onboard the Solar and Heliospheric Observatory tracked this material as it raced away from the sun, eventually forming a bright CME. Radio emissions from shock waves at the leading edge of the CME suggest an expansion velocity near 2000 km/s or 4.4 million mph. If such a fast-moving cloud did strike Earth, the resulting geomagnetic storms could be severe. However, because its trajectory is so far off the sun-Earth line, the CME will deliver a no more than a glancing blow. NOAA forecasters expect a weak impact late in the day on Feb. 26th. will not end any time soon although we will have earthquakes, sun flares, destructive weather, wars and radiation. SACRAMENTO – The witnesses saw a large black fly triangle, very low, very slow, and silent on February 13th 2014, about 7 PM. The four witnesses felt it looked like a TR-3B? My family has all verified that the pictures of these flying triangles with only three lights on bottom is exactly what we saw, as it flew right over us. We watched it for 10 minutes flying low. We noticed a stealth helicopter flying around pretty high with its light scanning the rooftops about a 1-2 mile area. We were all watching and looking up on Cottage Way, about a block west of Fulton. We watched this black flying triangle come right over the top of us, slow, low and silent and jumped in our car to follow. It looked more pointed at its tips than the TR-B3. I am convinced the helicopter was making sure people were not on any roofs and scare people to go inside. Thanks to John Hayes www.UFOinfo.com. LIVERMORE — Photo taken along I-5 from a moving car traveling from Pasadena to Oakland photographing California hills on February 25, 2014. Object in sky at first appears to be a cloud in an otherwise cloudless sky but it has shape and appears to be in movement. Nothing else in the photo was blurred or doubled because of movement. Please note utility pole and edges of the mountain are not blurred. This picture was taken with a Panasonic DMC-ZS25 digital camera. Perhaps this is nothing more than a digital aberration but I wanted others to see and comment. At the time of this photo, there were no clouds in the area although 8-10 minutes later, in other photos, clouds were gathering in the sky. So maybe just a cloud but I can’t get over what appears to be a leading edge on the cloudlike shape. WEST MIFFLIN — Over the course of a week my boyfriend and I had noticed and intently observed very strange silent lights/ objects in the sky that were varied in shape, color and size on February 19, 2014. These lights were glaring and glowing brightly near the Allegheny Airport. I was so astonished by what I had been seeing that I elected to stay up till daybreak. In the morning they disappeared into mid air. These objects appear around the same time and location. They morph into various shapes and colors and sizes. These objects disturbed me because they defy the laws of the physical world. COBAR, NEW SOUTH WALES — A bright light was moving at high speed fading in and out a couple times, and then hovering on January 2nd 2014. LAVRAS – In the state of Minas Gerais on February 8, 2014, at 12:15 AM, a craft was spitting large light particles when it suddenly exploded. However, the people in Lavras live in fear of such encounters due to possible military action, CIA knocking on their doors etc. But over the years, some not so great things have happened to people concerning this topic. Including the mysterious death of three UFOlogists in January 2014 in Brazil. VANCOUVER, BRITISH COLUMBIA – On February 14th 2014, at 9 PM, while driving home on Marine Drive I saw three bright orange spheres. 1t appeared like it was trailing behind and moving faster and catching up with two others. The lights flew north much higher than a chopper. They were very unlikely planes, jets, or choppers, because they all vanished very gradually after a minute of viewing. It was very risky viewing them because I was driving in heavy traffic. COLDLAKE – Our growling alarmed dog woke us at 3:20 AM, as we heard strange sounds of something moving around outside our farmhouse on February 11,2014. My wife is in the Military (35th yr), I’m ex Military so we can handle most situations. The dog ran to the northeast corner of our rancher growling. Immediately I noticed a pulsating hum ‘Noise’ which I find hard to describe, as in my 59yrs I haven’t heard anything like this. The noise was like an inner buzzing with an Energy-like ‘thickness to it’. It was moving back and forth on the Eastside of our farmhouse. At one point it went up to the top of our roofline, where a dog had just arrived from another farm and was freaking out barking at whatever was causing this noise. I briefly shined a spotlight out a westside window and saw the dog jumping and barking looking above me. My Dog Sally had started barking and we noticed the outside Dog Barking were somewhat strange like ‘Mechanical’ due to this Outside Unknown….This Noise then descended down to the Westside of our House then started moving around counterclockwise. GUADALAJARA –A diamond like UFO was caught in Mexico on February 14, 2014, that looks a lot like a past sighting, except this is not spinning. Back in Oct 28, 1979 a similar UFO appeared but it had a friend with it over a football game while being broadcast live on TV. Some announcer noticed it and told the camera man to zoom in on it and he did…this is what it looks like. Click here to see the 1979 UFOs over the Dallas Cowboys game. Thanks to UFO Daily. Spain Triangle with Three Bright Lights!! ROJALES – At 7:40 PM, on Monday evening February 3, 2014, I took my dog for her walk and looked up to the space station. Just to the right the station only about 1-2 miles from me I saw a triangle with three lights one to the front and two to the back? They were bright lights not the usual lights you see on planes, much brighter. LYCKSELE — I took two photos this autumn while out photographing the Aurora in northern Sweden on October 10, 2013. My friend and I saw two very bright stars among thousands and I told him, those stars don’t belong there. He looked up at the same time and the lowest light started to move away and higher. Two seconds later the other light also ascended. When I got home I looked at my photos and noticed that in the previous photo the lights were heading down in a zigzag pattern. I was in my bedroom watching Sherlock on my laptop when a bright object caught my eye out of the window on February 2, 2014. I observed a very bright light with a searchlight emitting from it for about 30 seconds. The searchlight varied as it would scan the ground for a few seconds then it would point to the clouds. I ran outside and could start to see an object that looked like a diamond with two red orbs orbiting the diamond. The object brightened with no searchlight from it. I realized the searchlight was on me and I heard a low hum as the metal railings surrounding me were vibrating. The searchlight then swung around and pointed on the clouds. The object then continued northwest and shot off. I could still see it low on the horizon hovering and getting dimmer. I took out my phone and I recorded the object for a few seconds till my battery died out. WAKEFIELD, WEST YORKSHIRE — I was sitting in bed looking up through the Velux window when I thought I saw a satellite move across the sky and stop so I opened my window to get a clearer view on February 13th 2014, at 8 PM. I couldn’t see it move so I thought that maybe I had moved my head and only thought it was moving. I shut the window and sat back down. A few minutes passed and I looked up to see two yellow/light orange objects appear at the top of the window. I opened the window and stood watching the two swooped down from a South/East to North West doing a sort of spiral dance in the air. They shot off behind my neighbors’ house. 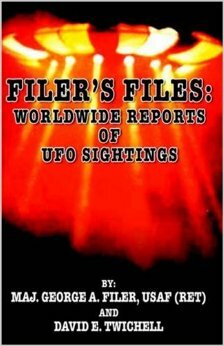 I am offering seventeen years of Filer’s Files on a DVD with thousands of photographs and sightings for a donation of $50 that includes this year’s subscription.